The feel of patriotism has spread all over and the celebrations of the day are remarkable. It is celebrated with flag hoisting ceremonies and cultural programs all over the country. The main program is held at the Red Fort where the Prime Minster unfurls the National Flag and it is saluted by Guns. My blog owes to celebrate the wonderful occasion too. 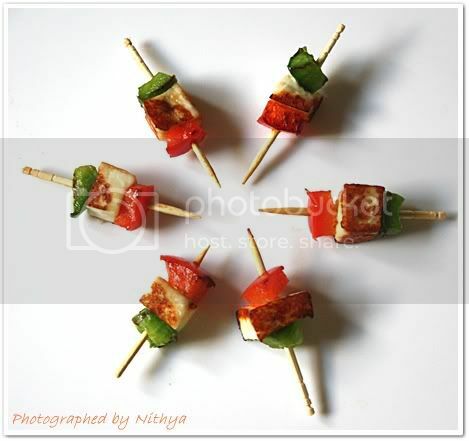 Dice the bell peppers and paneer into cubes. 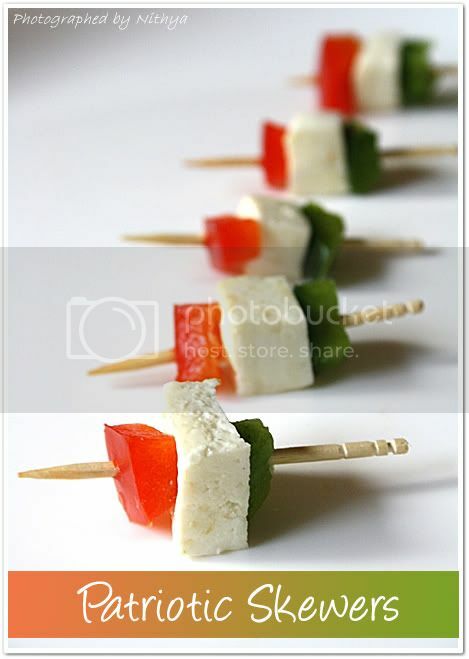 Thread them into the tooth pics sending in the green capsicum first followed by paneer and red capsicum piece. Apply some olive oil on your skillet and arrange the skewers on it to roast them. 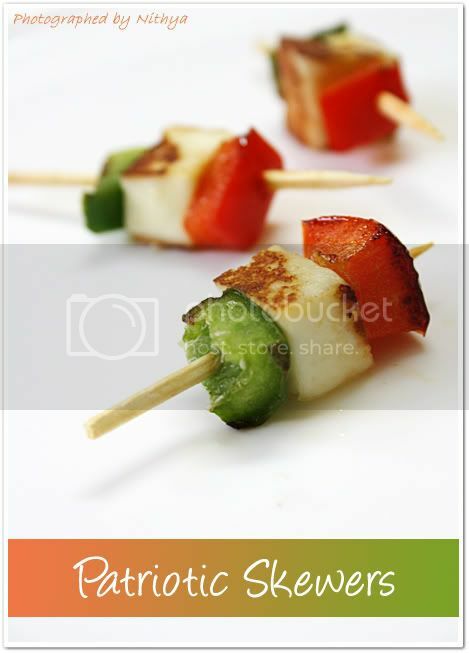 Turn the skewers in intervals to roast them on all the four sides. In a plate mix some lemon extract, salt, gharam masala and chilly powder to make a paste. Now apply the lemon chilly paste to the roasted skewers and allow it to marinate for few mins. Grilling the vegetables is a good option if you have facilities. Else roast it as I have said above. Vande Mataram !!! fantastic pictures and concept! May the freedom in cooking last forever ! Hey happy independence day!! Lovely way to celebrate....nice theme! Nce :) Happy Independence Day! Perfect treat for the great Day!! Hats off to your creativity. You are the one to "be praised"
Happy indepence day, nice skewers. Fabulous Nithya!! Looks stunning,the simplicity is even more appealing. 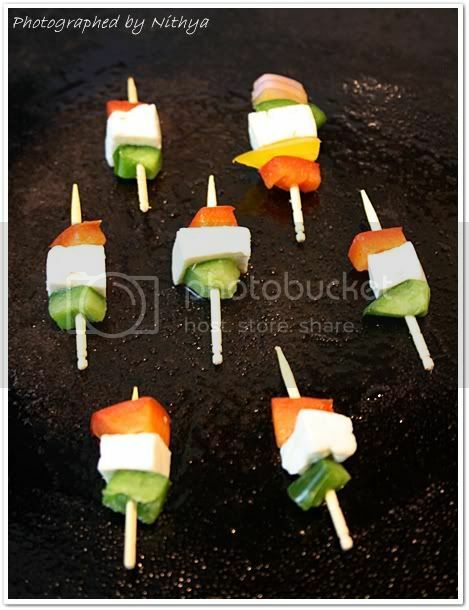 but then you always present food so well, and it would have been disappointing not to see a tricolor themed dish on you blog for Independence Day!! you creative gal!!! This looks awesome!! 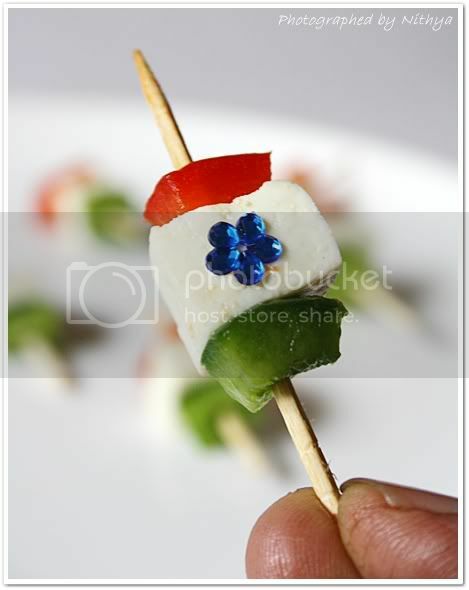 Lovely Skewers..Good way to celebrate Independence Day...Awesome pics !! A cute tribute... Happy Independence day! Happy Independence day!! 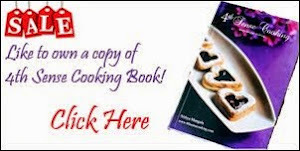 Simple and classic recipe with lovely pics! Great job dear! Cute pictures with nice idea nithi.. i was totally busy with Independence day celebrations and other stuffs. Wish U belated Happy independence day dear and will pass on ur regards to Aadavan. I think artistic view is a born gift for you. The photography tells the truth. What a cute and easy idea. Thank you for sharing!